Comvive Review 2019: Is Comvive a Good Hosting? Comvive is a Spanish web hosting provider that aims to serve their customers in the best way possible through good customer support and an easy-to-manage hosting account. They recently constructed their own data center to provide a more seamless, hands-on hosting experience for their clients. Comvive was established in 2003 in Seville, Spain. They proudly claim that many high-traffic websites in Spain are hosted on their servers. After being in the business for over a decade and a half, they decided to build their own data center in order to better control and manage the entire process of hosting for their customer base. There are many testimonials from happy and well-known clients on their website, which authenticates their claim of providing high-quality website hosting services. There are a number of ways Comvive makes website hosting as easy as possible for their customer base. For users with limited technical knowledge, the most attractive feature is perhaps their app installer. Most of the well-known applications like Magento, Drupal, and WordPress can be installed with a single click without the user having to worry about coding knowledge and the uploading of files. In case you already have a website with another host, you can get in touch with the technical team at Comvive and let them help you with the migration of your website. To improve the speed and performance of websites hosted on their servers, Comvive employs SSDs in all of their plans. By improving page load speeds, they not only ensure a smooth user experience, but also help their clients rank better in search engines. Another aspect of their hosting that helps with user experience is the active monitoring of servers 24/7 to make sure your website and applications are live at all times. In case of any mishaps, their automatic daily backup system will come to your rescue. Backups are kept for up to thirty days in an external storage drive. Last but not the least, there’s the control panel. This is a simple and user-friendly interface with no licensing requirements or domain restrictions. This appears to be their in-house developed control panel rather than an industry-standard brand name such as cPanel, but when I explored the interface, it appeared to be very similar and easy enough to learn. Note, however, that there’s no uptime guarantee with Comvive. When choosing packages for your hosting account, you have four different options named Start, Professional, Expert, and Reseller. They don’t offer unlimited disk space or bandwidth, though I actually prefer this as most “unlimited” packages tend to be misleading and actually have limits written into their fine print. That said, Comvive’s allocation of disk space and monthly bandwidth are more than adequate for each hosting plan. The same goes for email accounts, databases, and the number of domains allowed. Every plan comes with one domain registration completely free. They also include up to five discounted domains with each successive level up. What you should note, however, is the price tag that comes with each package. The first two packages, Start and Professional, are in a good price range. However, for the features that the Expert and Reseller plans offer, they are simply too expensive. 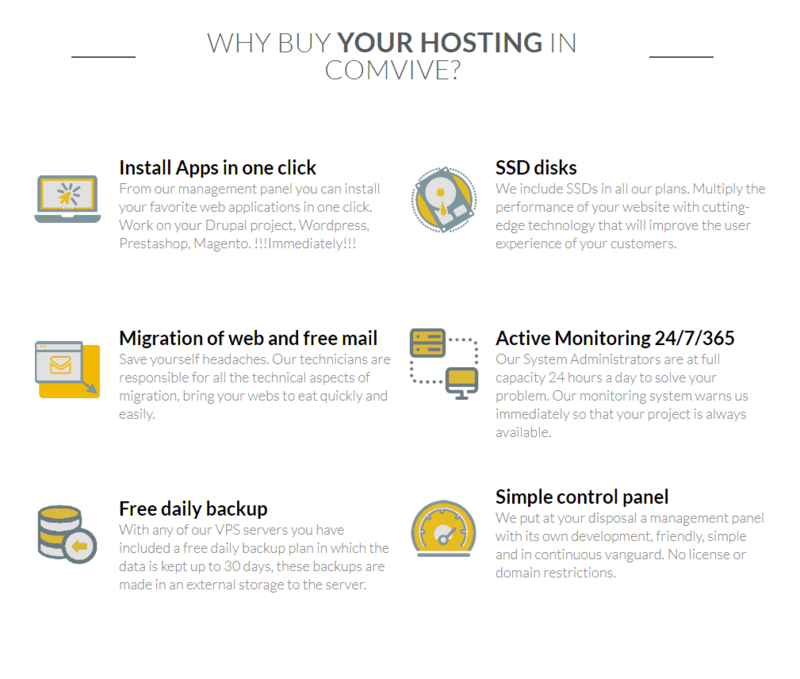 I fail to see how that price tag is justified, so if you have multiple websites or heavy hosting requirements, you’ll need to dish out a lot of money to host your websites at Comvive. The best way to get in touch with their support staff is through their ticket system or telephone. Sadly, there’s no live chat, and their Facebook and Twitter pages aren’t that active. However, it’s worth noting that they pride themselves on having real people ready to help you out with your queries, so getting good support related to your issues shouldn’t be a big problem. Comvive’s features are quite similar to what many other hosting providers offer, but they offer these features at prices that put them at a disadvantage. As far as I see, they don’t offer the value that would justify their price tags, and there aren’t any money back guarantees or trial periods to ascertain just how high-quality their packages are. Wondering how Comvive stacks up against other Web Hosting companies? Enter any other Web Hosting company and we will give you a side-by-side comparison.